My family and I recently tested this experience and I have been blown away! I was able to make all selections pre-arrival, including our room, admission (linking the tickets to our reservation), and even Fast Pass selections and times! When the package arrived (see pic), the kids were amazed. It was a joy for them to just wear the wristbands on vacation day. 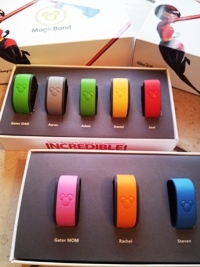 Each single wristband (Magic Band!) can do everything now; it let us into our resort room, it let us into the Parks, it let us onto fastpass lines (for attractions we pre-selected), and it even let us charge our food and souvenirs. This is the next generation of Disney and it is going to be fantastic!